Gicleé Printing is a relatively new computerised printing technique. It is unique to fine art publishing, such as ours here at the studios of Hood and Broomfield, where all work takes place in-house. Using only the highest quality watercolour paper with its special ink receptive coating, together with the finest light resistant inks, our country pictures manifest an exceptional depth of colour and tonal quality you would only expect to see in an original painting. Each picture is printed individually, inspected, trimmed and pressed, the artist will then examine each print before stamping the ( H B ) hallmark, numbering and signing, it finally goes to our framing studio for completion. 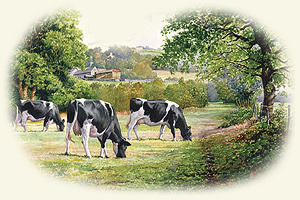 Our Company was established in 1966 and with more than Five decades of unrivalled reputation in fine art and it's presentation, Hood and Broomfield offer an invitation to view it's web catalogue and a fascinating display of pictures featuring old times and changing ways of the countryside. Available as signed limited editions in a choice of framing, packed and courier delivered to your door.